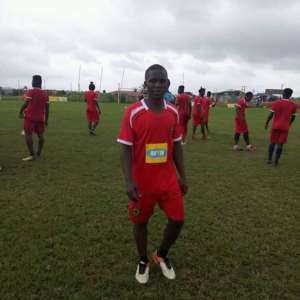 Former Asante Kotoko midfielder, Samuel Appiah has taken a swipe at Coach Charles Kwablan Akonnor, insisting the gaffer is not good enough to be with the club. The midfielder was released by the club on last week Saturday after failing to impress. But according to him, the former Dreams FC and Ashgold gaffer is working with nepotism and favouritism following a difficult spell in Kumasi. The midfielder, who joined from Nkoranza Warriors in 2017 struggled to break into the first team of the club. "C.K. Ackonnor isn't a good coach. To make matters worse, he had his favourite players and was overly selective," he told Sikka Sports. "At some point, I resolved to be lackadaisical in matches if given opportunity due to how he treated me," he added. Appiah Kubi did not play a part in the CAF Confederation Cup and was largely benched for friendly games. Meanwhile, the Reds began their GFA Special competition campaign with a 1-0 win over Aduana Stars on Sunday. Medeama SC will host Asante Kotoko in the matchday 2 of the Normalization Committee Special Competition.